It’s the end of a busy day and Bing is getting ready for bed. But when blankie gets wet, how will Bing get to sleep without it? 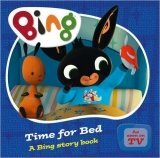 Join Bing and Flop in this gorgeous board book that is sure to become a regular bedtime treat.